April's recipes ride the cusp of late winter and early spring. All but one of April's recipes are vegetarian and many are vegan. All but one call for easy-to-find ingredients — and even the "hard to find" ingredient, dandelion greens, might be as close as your back yard! And then? 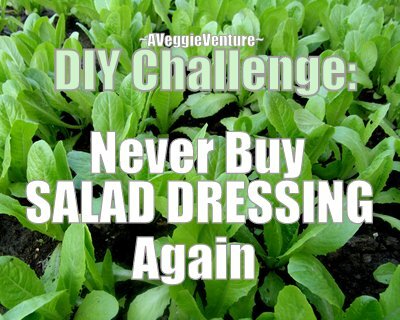 There are four salad dressings and a challenge, me to you, to "never buy salad dressing again"! 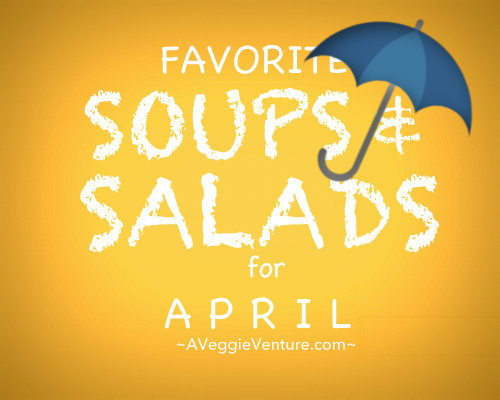 Mostly, I'm struck how April's seasonal recipe collection is a "bridge" between late winter and spring: the salads are mostly more substantial and the soups are lighter. Yes, that's April for a seasonal cook. I hope you love this collection, please do enjoy! Also good news for Weight Watchers: I've calculated the SmartPoints and Freestyle points for each and every recipe. The posts themselves haven't always been updated with the information but from this page, you've got the info. Whew. It's such a labor of WW Love to recalculate and update Weight Watchers' point adjustments every couple of years for 1300+ recipes here on A Veggie Venture + 600 more recipes at Kitchen Parade, my food column. But it's a work in process, trust me! I'm spending hours and hours and h-o-u-r-s on Weight Watchers point and mobile-friendly updates. Progress! A Year of Seasonal Soup & Salad Recipes? We're Six Months In! Crunch & Color. Vegan. Weight Watchers Friendly. Crowd Pleaser! Party Favorite! Beautiful In a Buffet! 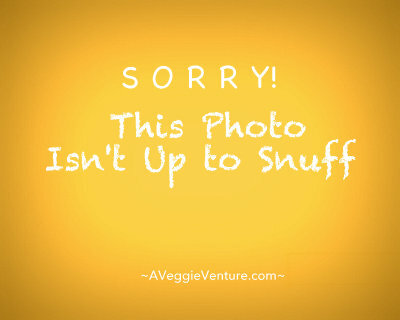 One of the Best Vegetable Recipes of 2011! Let's start off with a couple of show-stoppers, shall we? So much color and texture going on here, it just pops your eyes and your taste buds. Make this salad all year long, it delivers the sense of summer no matter the time of year! Pinterest Loves It! Vegan. Perfect Party Fare. A Classic Turned Upside Down. One of Best Vegetable Recipes of 2012! This is the Classic Seven Layer Salad gone all fruity for spring! And LOL, hey look! It's The Man With the Hands in the photo! Great Texture Contrast, Creamy & Crunchy. Versatile. Great Jumping Off Salad for Lots of Variations. "Positively Addictive." One of my Best Everyday Vegetable Recipes of 2015! I can't stop making this summer-y salad, just a few pantry vegetables and a lemon- and Sriracha-spiked mayo. One year, I made a giant batch for an after-wedding brunch, an extra-special giant bowl that included both balls of wet honeydew and blueberries. It disappeared in a f-l-a-s-h. So it's great for parties but honestly, it's a weeknight-easy salad for home, too. And besides, you might not want to share. Kid Friendly. Great Crunch & Color. Weight Watchers Friendly. Words to make a mom happy: "My kids devour this salad." It's the toasted pita chips, perhaps? perhaps? Whatever it takes, right? Quick. Easy for One, Easy for Company. Make It a Meal. 90% Meal Prep. Spring Specialty. Low Cal. Low Carb. Weight Watchers Friendly. Beginning in April, the grocery store summer squash are noticeably smaller (and thus younger) than later in the summer. So sweet, so tender, these. Take advantage! This is a simple, simple salad, just very thinly sliced summer squash gently tossed in a vinaigrette. Sumptuous! A Challenge, From Me to You! I swear, the #1 thing home cooks can do for themselves and their families is to ditch the gloppy, pricey, calorie-laden bottles of store-bought salad dressing. So back in 2008, I issued a little challenge. Ha! 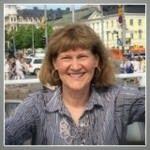 I even repeated it in new form for my friend Katie, who's joined with her daughter and other family members to build healthy eating and moving habits, see My Everyday Creamy Herb Salad Dressing, that's the "house" dressing right now. So how about a few simple ideas, just to start? Classic DIY. Pantry Ingredients. Fast & Simple. Low Carb. Recipe Makeover. Who else loves a good restaurant Caesar salad? Me too. You won't believe how easy (and inexpensive) it is to make Homemade Caesar Salad Dressing. I updated this recipe a few days ago, it's now on a 3x5 so that I can make it again and again! Super Simple. Make It On the Fly. No "Recipe" Required. Just Two Ingredients. One of the Best Vegetables Recipes of 2006! Good Oil + Honey + That's It! Everybody knows about "oil and vinegar" for salads, right? Heavens, there are even cute little cruets for the table, one for oil, one for vinegar. But here's a variation, oil and honey. Give it a shot! A Wartime Favorite. A Traveller Favorite. A Family Favorite. One of the Best Vegetables Recipes of 2008! Some times, the most unexpected recipe brings out the nostalgia in people. That's the way it's been for this simple German Salad Dressing. Be sure to read the comments for memories and many variations. Pinterest Loves It! Pantry Ingredients. Great for Meal Prep. Such a classic! A Greek feta-packed dressing will bring new life to your spring salads. We go through this like ... five kids and a bottle of pancake syrup. Low Cal. Naturally Gluten Free. Dairy Free. Paleo. Vegan. Ahhh, the pastels of spring, now in bowls of pale carrot soup! But there's nothing "pale" about the taste here, think fresh ginger, cardamom and coconut milk. Weight Watchers Classic. All About the Asian Vegetables. Pinterest Loves It! One of the Best Vegetables Recipes of 2008! Spring Classic. 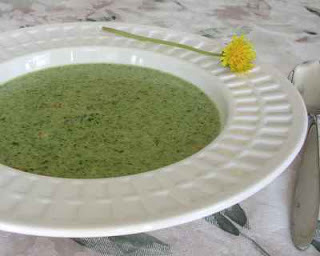 One of the Best Vegetables Recipes of 2007! Vegetables 101: What Are Crudites? Raw. Weight Watchers Friendly. Low Carb. Vegan. Great Color and Freshness for Buffets Year-Round. A Pretty Mix of Your Favorite Vegetables. That's It! Even at parties, I'm struck how many people load up on fresh salads and vegetables — and then shun the desserts. Sure, you can buy a tray of vegetables at the grocery store. But the honest truth is that the vegetables are t-e-r-r-i-b-l-e and those dried-out and flavorless vegetables don't get eaten. If you're going to make a vegetable platter, make it a pretty one! This post has all the tips and veggie-happy ideas.